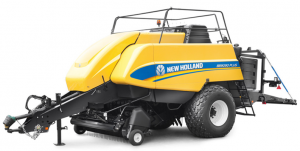 The BB9090 PLUS is the largest model of the New Holland big baler range. Its superior performance both in terms of perfect, firm, well-shaped bales as well as high daily output, is the result of the combination of outstanding features and operational convenience. On top of the massive bale size and the proven double knot system, the plunger of the new BB9090 PLUS makes 33 strokes per minute which means high speed baling while maintaining superior bale shape. Its modern appearance reflects its compliance with the demands of today’s large scale straw baling operations.